Every day we struggle to define ourselves in relation to the amorphous mass of humanity. In a sea of styles, opinions, tastes and philosophies we compete to stick our head above the parapet and yell "I exist!". What is a Facebook wall, a Twitter page, a culture website or an Instagram feed if not a way to to assert our individuality in a world where we're silently categorised by pure demographics? But what is this identity made of? How strong is it? Can you destroy it and don a new one? Is who you are determined by what you do, see and hear or by what you think? It's these questions that Mark Farid wants to answer. That's is why he's spending 28 days with virtual reality goggles strapped to his head, vicariously experiencing someone else's life through twin HD cameras and microphones attached to a subject.. This is, to say the least, an ambitious project. Questions arise almost immediately. 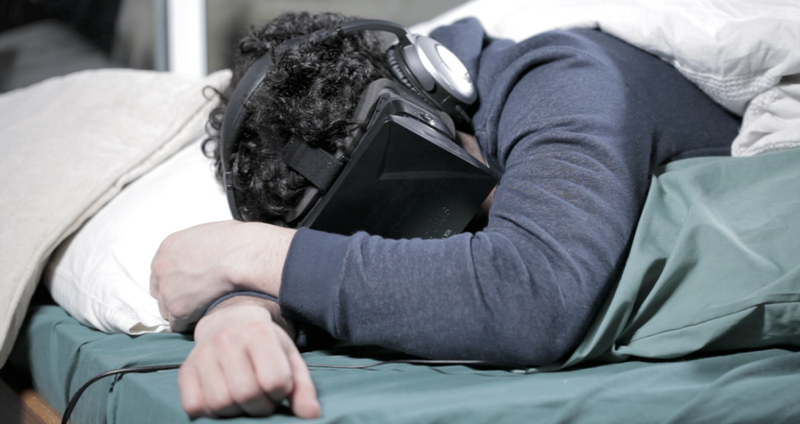 How on earth can he spend a month in virtual reality? Whose life is going to be observed? How will he eat, shower or sleep? Won't his eyesight get ruined? Who's going to look after him? And so on and so on. Well, the only criteria for the life to be recorded, known as the 'Other', is that they're a heterosexual male who is living with a girlfriend or wife. It'd be interesting in itself to see how Mark would react to living in a woman's head for a month, but that arguably diffuses the focus of the exercise. Having a partner allows the Other to explain what they're doing at any given time; for example rather than just going out to the shops he'd say "I'm going out to the shops to get some milk", allowing Mark to understand what's going on. If all goes to plan the artist will be a silent passenger in a complete stranger's head: seeing, hearing and tasting everything they do. This complete lack of autonomy sounds equally frustrating and boring, after all life can be dull enough when you're the one in charge of what you're doing. I imagine what Mark wants to experience as being a very special kind of hell, stuck as the ultimate backseat driver; silently fuming at all the 'wrong' decisions, idiotic comments and wincing with embarrassment as someone makes a fool of themselves. Professor Simon Baron-Cohen has made a series of predictions as to the psychological impact of this; "he might become more empathetic ... he might experience distorted perceptions and even delusions". Mark himself predicts that "after five or six days my breakdown will happen, and then it becomes interesting." I detected a slightly cavalier approach to mental health in this answer; so I asked Mark if he considers himself a masochist. He denied it, but to my eyes anyone who will willingly subject themselves to something that comes close to torture for so long in the name of art must derive some satisfaction from inflicting pain upon himself. After all, even though Mark will be viewing video through VR goggles, this is still a form of sensory deprivation, the duration and intensity reminiscent of the CIA's astonishingly unethical MK ULTRA experiments. They'd take volunteers, remove stimulus (placing goggles on them that diffused light and headphones that played constant low noise) and confine them for extended periods of time to observe the psychological impact. The most relevant of these experiments involved altering the receptiveness of the subject to new ideas; for example taking psychology students, removing external stimulus, and exposing them to recordings of voices expressing creationist, mystical and generally delusional opinions, notions that scientists could be expected to oppose. What was discovered was that after prolonged periods of sensory deprivation the subjects would become overly vulnerable to any stimulation. They'd would find themselves in agreement with whatever they were told, even if they were ideas that they'd have automatically dismissed as ridiculous prior to the experiment. Of particular note to Mark is a quotation from Alfred McCoy's excellent book A Question of Torture: CIA Interrogation, from the Cold War to the War on Terror: "Even short term deprivation produced a devastating impact upon the human psyche. After just two to three days ... the subject's very identity had begun to disintegrate". He later reports that the subjects "all suffered eerie hallucinations akin to mescaline use as well as deterioration in the capacity to think systematically and concludes by noting the potential for "serious disturbance" in the subject's life. 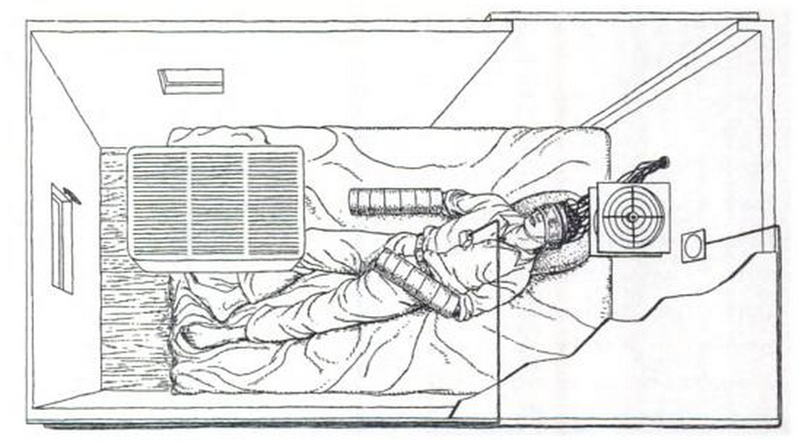 A CIA experimental isolation cubicle. Long term impacts included, at worst, regression to a child-like mental state, though and former subjects had a worrying tendency to end up homeless, schizophrenic, drug addicted or victims of suicide (or any combination of the above). Now, Mark, curator Nimrod Vardi and director John Ingle repeatedly underline that this is not a test of endurance, that they'll have medical professionals monitoring Mark and if its judged that he's experiencing permanent damage they'll stop the experiment immediately. Even so, after a load of publicity, hype and fundraising there'll be obvious pressure to keep this going as long as feasibly possible. Now I have absolutely no problems with someone harming themselves for the sake of art, it's Mark's body and as long as he's not harming anybody else he can do with it what he likes. In addition I'm ghoulishly curious as to how long he can stand it (my prediction is that if the CIA's guinea pigs freaked out so quickly, he'll crack within the first week and the medical team will stop the experiment). A man exploring whether its possible to erase his own identity and live the life of another used to be the stuff of science fiction. But with new technology, imagination, ambition and Mark's willpower and endurance we can explore questions that will become ever more relevant as we face a digital future in which apparently anything is possible. I deeply hope Mark raises the money to fund this crazy experiment, if only because I want to live in a world where things like this can happen. To my eyes he stands like an explorer of old confronted by an infinite ocean. What's on the other side? You may have to sacrifice your safety, health and sanity to know (and maybe the ocean really does stretch on forever), but sometimes these sacrifices are truly worthwhile. More articles to come as this experiment develops.